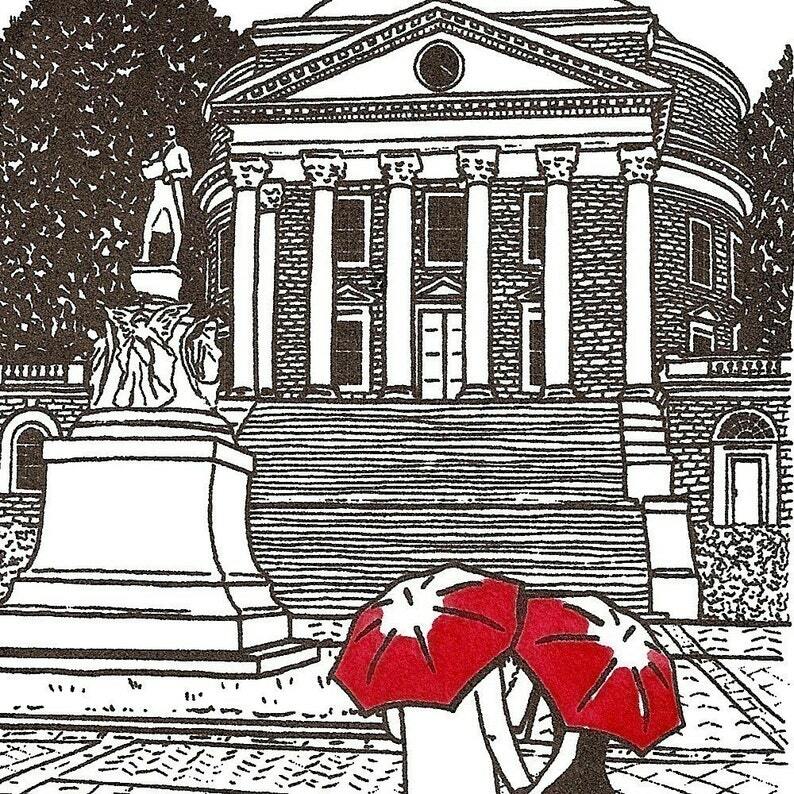 This gocco screenprint is the second in my new "College Love" series, and features a couple walking near UVA's Rotunda under their red umbrellas. While UVA is not my alma mater, I always considered it my foster school! I spent 4.5 years driving back and forth over the Blue Ridge Mountains between UVA and JMU nearly every weekend to see my now husband. Perhaps the reason I loved it so much is because I never had to actually go to a class there- it was all fun! So, UVA will always occupy a special place in my heart, because we really had a great time, and met some wonderful people we're still friends with today. I think the couple in this print has just had a delicious meal on the corner (definitely either at Little Johns or Bodos), and are going to take a leisurely stroll on the lawn. This print is hand printed from an original illustration, and the red umbrellas are individually painted with watercolor (please allow for some minor variations, as each one is individually printed and painted). The printed area is approximately 5.5 x 3.5 inches on white Stonehenge paper. Total print size is approximately 9 x 6 inches. Each print is signed and titled "UVA Love."